This year the now seven, almost eight year old, will be old enough to go too. Imagine that a whole week with the 10 and 8 year old off on an adventure. A whole week with just time for me, hubs and my 2 year old. (He'll be old enough before we know it too!) A whole week of my boys learning, smiling, adventuring, and yes, missing mom a little bit, but definitely growing. Operation Purple Camp is accepting applications. If you have a military-brat between ages 7 and 17 jump at this chance. They are accepting applications from now through March 4. This is a great chance for the kids to spend time with other military kids, away from the stress of home, making new friends from around the country. Best of all, it is free! Operation Purple camps offer a free week of summer fun for military kids with parents who have been, are currently, or will be deployed. The goal of the Operation Purple camp program is to give military children tools to help deal with the stresses that result from a parent’s deployment, through a memorable camp experience in a “purple” environment. Operation Purple camps are open to military children of all ranks and Services: active and reserve components — priority is given to military children who will experience a phase of deployment between the months of September 2012 and December 2013. 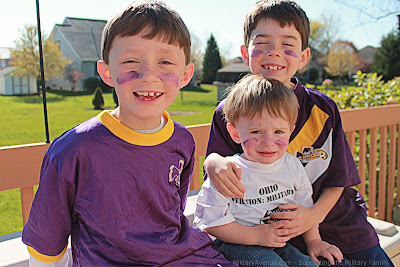 My boys dressed in the color of the military brat, Purple! My boys are not going through Operation Purple Camp as we have an opportunity to attend a great camp, Camp Ligonier, through our church. However, if you are eligible to apply for a free camp through Operation Purple all I can say is get those dirty shoes ready, find extra socks that you quite possible won't see again, and perhaps pack the underwear that won't get changed all week. Apply today!